Murles Point, Co. Donegal, Ireland; to 110 mm. 27 May 1994. Michael Guiry. © Michael Guiry (mike.guiry@nuigalway.ie). Spain, Galicia, A Coruña, 2005; superficial and TS microscope view. Ignacio Bárbara. © Ignacio Bárbara (barbara@udc.es). Spain, Galicia, Lugo, San Ciprián, 2005, lower intertidal. Ignacio Bárbara. © Ignacio Bárbara (barbara@udc.es). Spain, Galicia, A Coruña, Ártabra, intertidal, 2005. Ignacio Bárbara. © Ignacio Bárbara (barbara@udc.es). Spiddal, Co. Galway, Ireland; lower intertidal pools on Corallina officinalis. 30 Sep 2007. Michael Guiry. © Michael Guiry (mike.guiry@nuigalway.ie). Muigh Inis, Co. Galway, Ireland; on rock. 13 Apr 2006. Michael Guiry. © Michael Guiry (mike.guiry@nuigalway.ie). Published in: Newton, L. (1931). 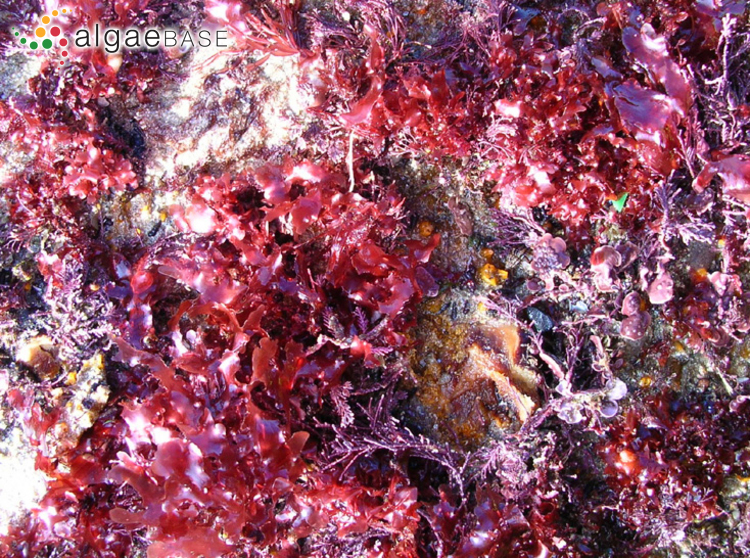 A handbook of the British seaweeds. pp. [i]-xiii, 1-478, 270 figs. London: The Trustees of the British Museum, British Museum (Natural History), Cromwell Road, S.W.7. The type species (holotype) of the genus Cryptopleura is Cryptopleura lacerata (S.G.Gmelin) Kützing. 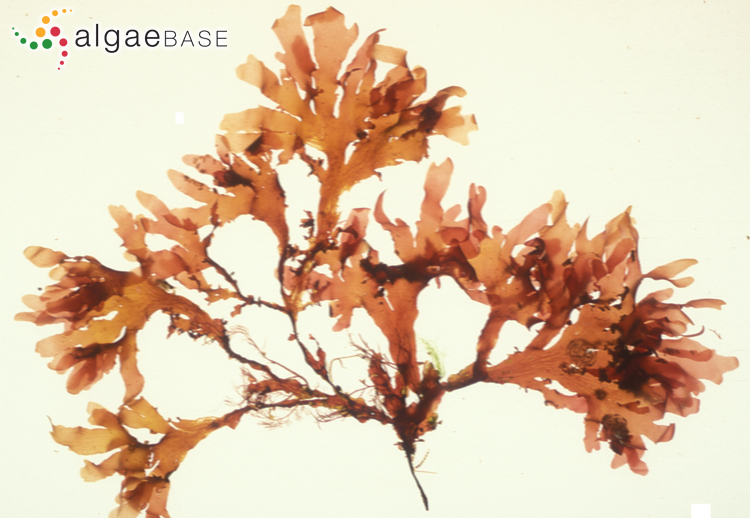 Type locality: Lancaster, England (Silva, Basson & Moe 1996: 900). Adjective (Latin), branched, bearing branches (usually many) (Stearn 1973). Cryptopleura ramosa var. lobata (Kützing) ? Newton (1931: 332) attributed the combination to Kylin without explanation, but was probably aware of a pending publication via correspondence. Often credited to "Kylin ex Newton". 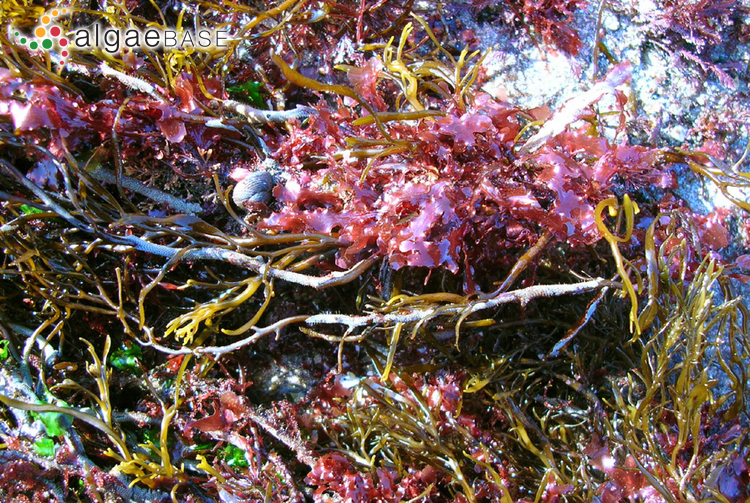 English: Fine-veined Crinkle Weed (Bunker et al. 2010). 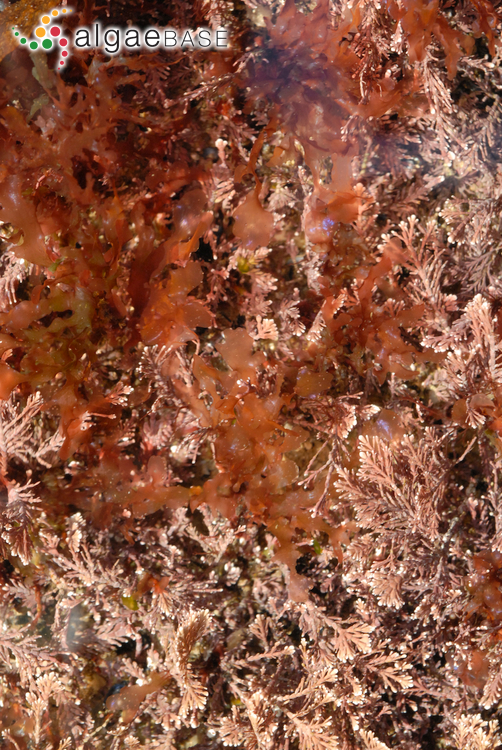 Thin, membranous, brownish red fronds, to 200 mm long. Frond ± dichotomously divided, becoming irregular in upper parts. Frond often iridescent, with undulate, often proliferous margins, sometimes with flattened hooks or with rhizoidal attachment processes. Very variable in growth form. 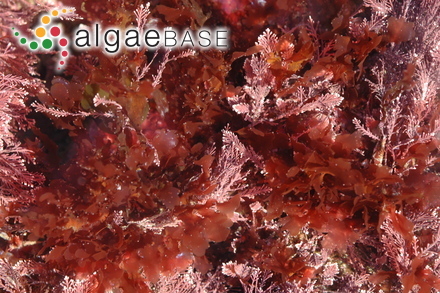 On rock and Laminaria hyperborea stipes, lower intertidal and subtidal, generally distributed, common. 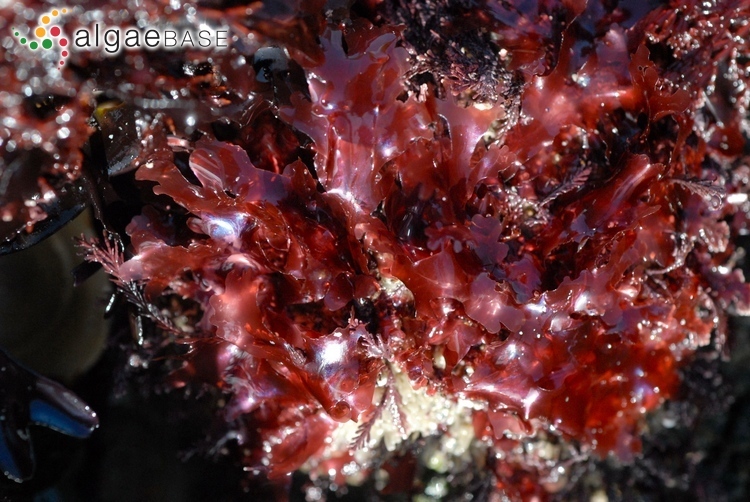 Gonimophyllum buffhamii, a minute parasite, occurs occasionally on subtidal plants on southern and western coasts. Acrosorium venulosum is less translucent and recurved branches are not as strongly recurved. Wynne, M.J. (2014 '2013'). The red algal families Delesseriaceae and Sarcomeniaceae. pp. -326, 118 figs. Königstein: Koeltz Scientific Books. Accesses: This record has been accessed by users 11901 times since it was created. Baardseth, E. (1974). Cryptopleura ramosa (Huds.) 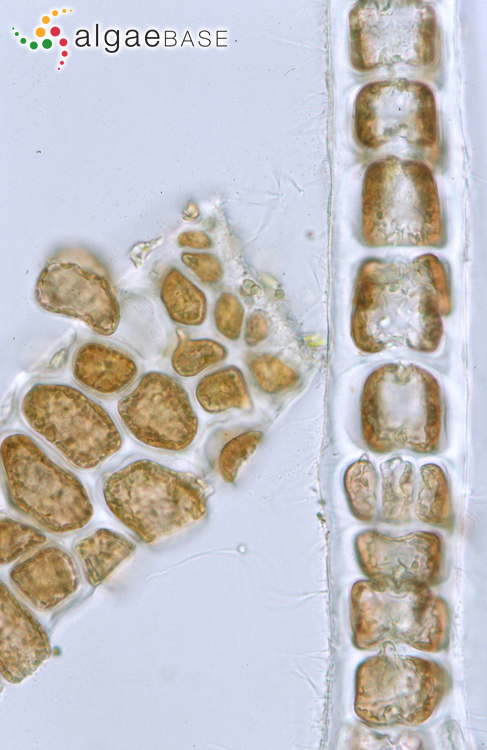 Kylin ex Newton (Rhodophyceae) and Omphalophyllum ulvaceum Rosenv. 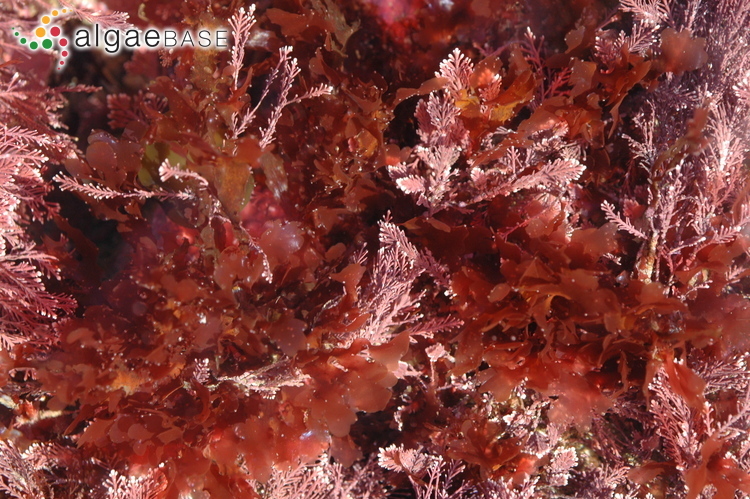 (Phaeophyceae) new to Norway. Sarsia 57: 109-112.